Using hand to milk a cow is not as easy as it may look. The milking process requires lots of work and time to learn properly. If you don’t know how to milk a cow by hand, then the milking process is going to be more difficult to you. If you raise at least a few cows for family use, then you must have to know about milking a cow by hand. Actually, you will need to milk your cow everyday to fully reap the benefits of a dairy cow . Because the cows may stop producing milk or develop problems with their teats, if they are not milked on a regular basis. Learning more about how to milk a cow by hand and milking your cow/cows on a regular schedule can prevent such problems from occurring. Fist of all secure the cow’s head before you begin milking, so that the cow can’t wander off. Then clean her udder and after that sit on a sturdy stool and lubricate each teats before you begin milking. Then pull downward from the base of the teat, and squeeze the milk out into a bucket. However, here we are describing more about the process of milking a cow by hand. First of all you will need to secure the cow. To do so, you can tie the cow to a stable fixture. You should tie the cow in a low-stress and quiet environment. You should approach the cow slowly, because your cow can get afraid or be nervous if you move fast. And the milking process will be more difficult and unpleasant for both of you and your cow if the cow is anxious or afraid. If you have a stanchion in your farm, then you can effectively secure your cow by using that. You need to clean the udder and teats of your cow with soapy water or iodine before start milking. You need to wash the teats for preventing soil, and also any bacteria that it may contain, from contaminating the milk. If possible, try using slightly warm water. Because washing with slightly warm water may help coax or bring down the milk. Another important thing is ‘don’t milk your cow if her teats are still wet’. Because the soap and water may drip down into the milk bucket and contaminate the milk. You can dry the teats by using a clean and soft cotton cloth. Follow the step by step guide below for milking a cow by hand. Your hands can carry bacteria, and such bacteria can be harmful if transmitted to the cow. So, you need to wash your hands by soap or handwash (you can also use a pair of latex gloves for milking). After washing your hands, apply a lubricant to your hands for minimizing friction. You can use petroleum jelly or any edible oil as a lubricator. There are some people who prefer to use udder cream for lubricating. Strip each teat for several times. Actually stripping is the process of pulling down a cow’s teat in order to pass any dirt, bacteria or other derbis from the milk ducts. And don’t catch the milk from stripping in the milk bucket. Place a bucket underneath the udder of your cow (this bucket will catch the milk that you squeeze from the udder). Holding the bucket between your legs will be better. It requires practice, time and patience, but it will be easy and comfortable for you after sometime. You can also tick your cow by giving her grain or hay during milking. Doing so will ensure the cow stands still in most cases. You should seat yourself in a position that will allow you to move away quickly if the cow becomes uncooperative. It’s good to sit or squat on the right side of the cow. Your body should be very close to the cow (especially underneath the cow), so that there is as little distance as possible between the bucket and udder. Wrap your one hand around 2 of the 4 teats. You can choose front two teats first, and then the back pair. Or you can also try diagonal teats, for example front left and rear right. Then begin milking by gently clamping each teat between your extend thumb and first finger, so that the teat fills your palm as you squeeze down. For increasing milk yield, you may need to gently bump against the udder. Doing so will help to stimulate the udder to let down milk as a calf would. As you press down on the teat, maintain your grip on the base of the teat so that the milk doesn’t flow back up into the udder. Be gentle yet firm while milking your cow by hand. You should milk your cow until the quarter that you are milking looks deflated. Generally an emptied quarter of the udder will look saggy and wrinkled, and feel much softer and more malleable. While a full udder will appear tight and be firm to the touch. 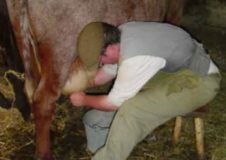 Actually this requires practice, and an experienced farmer can fell the udder to know exactly when all the milk has come down. Repeat the motion with your other hand on the adjacent quarter after you have milked 1 quarter. Then move on to milk the other 2 teats. You can change your position and move to other side of the cow if you began milking the two teats on a side. But changing side is not necessary if you use the diagonal milking method. Hope you have already learned a lot about how to milk a cow by hand. Milking a cow properly actually requires lots of time and practice. The more you milk your cows the better you will be able to milk them.